Alchemist and Evidence are brothers from another mother. 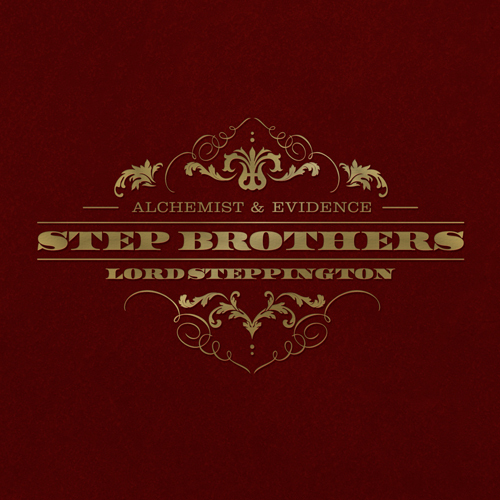 The pair have performed as a duo for a few years now and are finally releasing the joint project, Lord Steppington through Rhymesayers Entertainment at the first of the year. The LP will be produced entirely by Alc and Evidence and includes guest appearances from Action Bronson, Roc Marciano, Blu, Fashawn, Rakaa Iriscience, Oh No, Styles P, Domo Genesis & The Whooliganz. Check out the track list for Lord Steppington, below. Also peep the Step Brothers track “Ron Carter” after the jump. The album will hits stores and iTunes January 21. But in the meantime, you can wait for the pre-order that will be available on November 19. Timothy Rhyme nearly lost his life on July 18, 2011. He bled out internally and almost met the man upstairs. Since that traumatic day, he has bounced back like James Blake. Shortly after his recovery, he moved to LA to be closer to his daughter, got into CSUN, has made some significant strides in his music career, and kept his focus on helping people. Nay The Producer was diagnosed with Lupus August 2012. She spent the entire month of October 2012 in the hospital. This flare up was so severe it caused fluid in her lungs, fluid around her heart and two blood transfusions. To go from a self reliant, hard working woman, to needing the assistance of a walker and cane to do menial things has put her in a hard spot. Regardless, she keeps fighting and hasn’t let this unrelenting disease stop her from moving forward. Both have seen their lives be flipped upside down and completely altered forever. This campaign is an attempt to raise funds to put together an amazing album but it subconsciously is touching the warrior spirit that we all have. Some people would have let their circumstances get the best of them but Timothy Rhyme and Nay The Producer would not let defeat be a word that described them in this story. This campaign is important for several reasons. Not only will it allow Tim and Nay to tell their story. But it will allow them to inspire others and show other people in similar predicaments that there is some hope and that they aren’t alone. Music is one of the most powerful tools in lifting a persons spirit and this is one of the main objectives of this album. In a world where most of the messages in music are about “cool” stuff and a glamorous life, Tim and Nay attempt to show that you can still make good music with a good message. If you have ever faced a challenging time in your life and just wished you had that little nudge to get you to the next step, this is your chance to be that to someone else. This is your chance to be apart of the Comeback Of The Century! Crooked I releases a new video for his “Against All Odds” record.